Jeff Levin, Ph.D., M.P.H., University Professor of Epidemiology and Population Health and Director of the Program on Religion and Population Health at the Baylor Institute for Studies of Religion, has co- edited a special section of the latest issue of the American Journal of Public Health on the topic of Faith-Based Organizations and Public Health. The section was co-edited with his colleagues Ellen L. Idler, the Samuel Candler Dobbs Professor of Sociology at Emory University; Tyler J. VanderWeele, the John L. Loeb and Frances Lehman Loeb Professor of Epidemiology at Harvard University; and Anwar Khan, President of Islamic Relief USA. 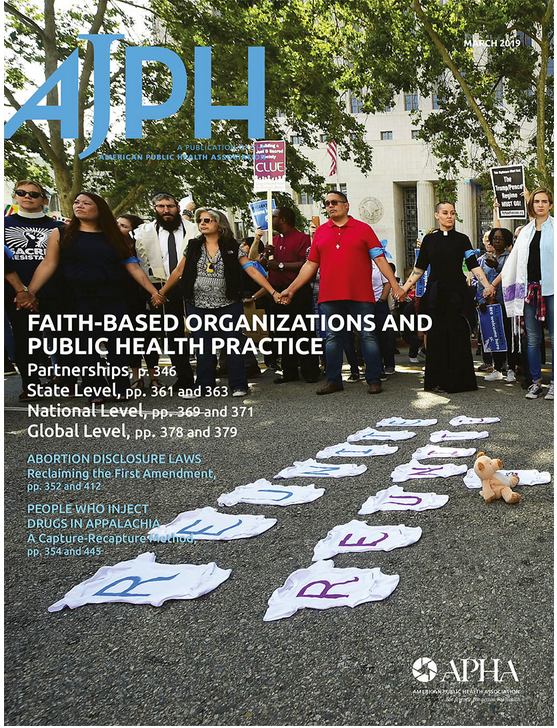 The special section is a landmark for public health—the first time that the field’s flagship journal has devoted such focused attention on the role of religion and faith-based partnerships. According to Alfredo Morabia, Editor-in-Chief of the journal, “[H]istory shows that faith-based organizations can bring people together for positive purposes and can represent powerful agents for health and justice.” The special section includes original research, program reports, and associated commentaries on faith-health alliances at the local, state, national, and global levels of engagement. Contributors include academic and public health and medical professionals from Harvard, Wake Forest, Emory, the Mayo Clinic, North Carolina State, UNC Greensboro, and World Vision International. Expert commentators include William H. Foege, former Director of the Centers for Disease Control and Prevention and former Executive Director of The Carter Center; David R. Williams, the Florence Sprague Norman and Laura Smart Norman Professor of Public Health at Harvard; and Howard K. Koh, the Harvey V. Fineberg Professor of the Practice of Public Health Leadership at Harvard and former Assistant Secretary of Health under President Obama. To celebrate publication of the journal issue, Emory is hosting an invited symposium on April 3rd. Levin will be participating on a special editors’ panel, and will moderate other parts of the event, which will be live-streamed from the website of the Rollins School of Public Health at Emory. This project is one of multiple ongoing Baylor-Emory-Harvard collaborations. Last year, for example, Levin and Idler co-authored an important commentary on Islamophobia and public health, also published in the American Journal of Public Health. Currently, VanderWeele is working with Byron R. Johnson, Director of Baylor’s Institute for Studies of Religion, on a major project related to human flourishing, one of the signature academic initiatives of Illuminate, Baylor’s academic strategic plan. Levin is hopeful that these projects will be instrumental in continuing to forge academic partnerships for Baylor with the other major institutions working at the intersection of faith and population health. Besides Emory and Harvard, these include Levin’s longstanding research relationship with Duke University School of Medicine, where he serves as Adjunct Professor of Psychiatry and Behavioral Sciences and as a Faculty Scholar at the Center for Spirituality, Theology, and Health. Levin’s latest book on this subject, Religion and Medicine: A History of the Encounter Between Humanity’s Two Greatest Institutions, will be published this fall by Oxford University Press.